We'll cover what correlation is, why we measure it and how we measure it. Correlation measures the degree to which two DARWINs' returns move in relation to each other. It is computed into a correlation coefficient whose value must fall between -1 and 1. When the correlation between two assets is 1, it means that by investing in both of them you are not diversifying at all. When correlation between two assets is around 0, investing in both means a partial diversification of your portfolio. And when you invest in two assets with a correlation of -1, it means that your risk is zero as the returns of your assets move in exactly the opposite direction. We measure correlation to calculate the risk of your investment. Remember the tutorial with the title "The Risk of a Portfolio of DARWINs"? 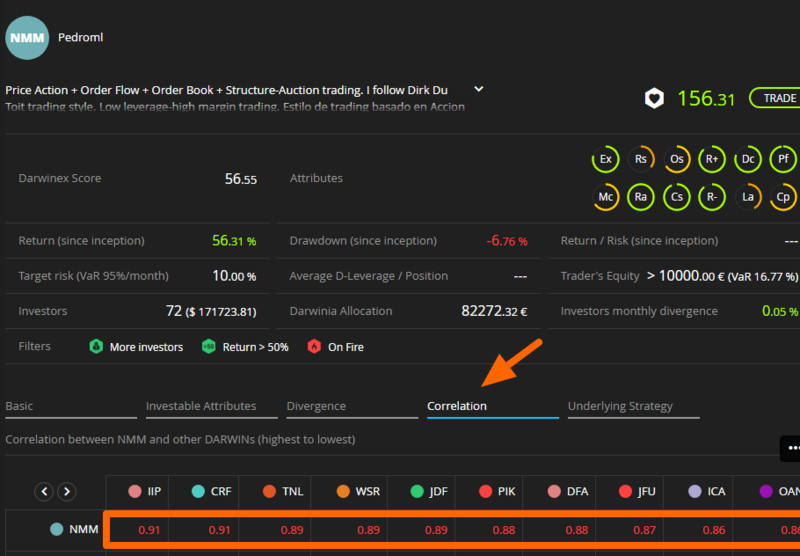 In this tutorial, we explain that the risk of your investment depends on the correlation between the DARWINs in your portfolio and that there is a diversification benefit which lowers the risk of your investment. We structure time into 8-hour-windows of the last 21 market days, that is, we compare return in 63 8-hour-windows. And what we exactly look at is how return was moving in these windows. We take into account only windows in which at least one of the DARWINs was trading. As you can guess from the above, our correlation test usually covers 1 month, so it is the 1-month-graph which shows what exactly is behind the correlation coefficient. However, when there are 8-hours windows in which neither of the two DARWINs was trading, we go beyond the last month and fill up the 63 windows with earlier data. The maximum we look back is 3 months. Please note that a high correlation does not necessarily mean that the DARWINs are trading the same assets. It just means that their return is moving very similarly.